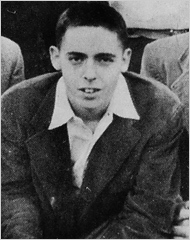 Thomas Pynchon is one of my favorite authors (Joyce holding the #1 spot). But does he play the ukulele? Some sources suggest yes. But since there have been few sightings of the reclusive author, one can only speculate. And we here at Ukulelia are happy to oblige. Exhibit A: Pynchon and Formby Headshots. Could the physical resemblance between Pynch and George Formby be mere coincicence? Perhaps. But the resemblance and the common uniform be anything more than a blatant clue? One need only compare the images accompanying this article to understand the power that this theory holds over the contemporary mind. 'He does have some rather snappy arrangement,' Tantivy reports, "he's a sort of American George Formby, if you can imagine such a thing, but Bloat's decided he'd rather not. "Our information about Pynchon comes from a 1977 article by Jules Siegal: '[Pynchon] could carry a tune well and made up ribald parodies of popular songs, which I seem to remember-- surely I am imagining this-- were accompanied on a ukulele.' "
Exhibit C: Against the Day. Ukuleles are again present. According to this review, of Pynch's just-published novel, "as early as page 15, someone picks up a ukulele and sings a silly song..."
"Spanning the period between the Chicago World's Fair of 1893 and the years just after World War I, this novel moves from the labor troubles in Colorado to turn-of-the-century New York, to London and Gottingen, Venice and Vienna, the Balkans, Central Asia, Siberia at the time of the mysterious Tunguska Event, Mexico during the Revolution, postwar Paris, silent-era Hollywood, and one or two places not strictly speaking on the map at all. "With a worldwide disaster looming just a few years ahead, it is a time of unrestrained corporate greed, false religiosity, moronic fecklessness, and evil intent in high places. No reference to the present day is intended or should be inferred. "The sizable cast of characters includes anarchists, balloonists, gamblers, corporate tycoons, drug enthusiasts, innocents and decadents, mathematicians, mad scientists, shamans, psychics, and stage magicians, spies, detectives, adventuresses, and hired guns. [Clearly, all uke player references. -- ed.] There are cameo appearances by Nikola Tesla, Bela Lugosi, and Groucho Marx. "As an era of certainty comes crashing down around their ears and an unpredictable future commences, these folks are mostly just trying to pursue their lives. Sometimes they manage to catch up; sometimes it's their lives that pursue them. Meanwhile, the author is up to his usual business. Characters stop what they're doing to sing what are for the most part stupid songs [Again, a uke reference!]. Strange sexual practices take place [!!]. Obscure languages are spoken, not always idiomatically [!!!] . Contrary-to-the-fact occurrences occur. If it is not the world, it is what the world might be with a minor adjustment or two. According to some, this is one of the main purposes of fiction." Clearly, this work will soon come to be recognized as one of the pillars of ukulele lit. Other items from the Pynchon/Formby Conspiracy files include evidence of the model of uke that Pynch would most likely play, as well as a potential musical fixation. "Let the reader decide, let the reader beware. Good luck."